Are you ready to extend your business reach by joining the incredibly successful Grundy County Chamber of Commerce and the Channahon Minooka Chamber? Refer a Member and receive Chamber Cash! How has your business benefitted from being a member of the Chamber? The signs are everywhere you turn. From inflated commodity prices to news reports of job losses, we're hard pressed to keep a good attitude about the economy. So if you're one of the many that have begun to see the impact of a struggling economy, I have extremely good news for you. Yep, there's an easy way to increase your business and be one of the haves in this have-not cycle. Imagine arriving at a place where everyone (or at least nearly everyone) knows your name. You are welcomed by friends and acquaintances who are happy you're there. Better still, most of them are ready to help you build your business and are even referring you to their family and friends. And you experience this environment several times a month. But there's more. This is a place where you can hone your skills as well. You'll have the opportunity to attend educational programming at a fraction of the cost available to the public. Often you meet people here who have experiences you can learn from. You're introduced to the movers and shakers. You can even demonstrate your commitment to the community by serving as a leader. Your only limit is you. Sure, this may appear to be a thinly veined cover of a shameless plug for your local chamber of commerce. And it is. But here's why I've dedicated this article to the idea that you must be a member of the chamber in these challenging times. You need to share your message with as many people as possible for the lowest investment of dollars. For a couple hundred bucks you'll be a member of a business organization where you can communicate to a closed group of hundreds, if not thousands of potential customers and networking partners. You need to build a network of people who are thinking of you first when they are asked by their customers, friends, family and vendors who they would recommend to provide what you're selling. By the law of averages the best opportunity you have to fill your networking base is in a big crowd of business people. That is your local chamber of commerce. You need to be in the know about current events and what changes may be coming that could affect future business. The chamber is the epicenter of business trends. You need to be able to prove your worthiness to potential partners, vendors, customers and networking partners. The chamber affords you the opportunity to serve and thereby demonstrate your skills. You need to be in a supportive atmosphere where you can see that others are still doing well and you can too. Again, the chamber stands alone as a positive voice for business. 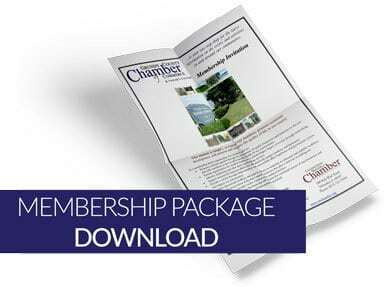 If you're not a member of the local chamber you owe it to yourself to join today. When you join, get involved. Volunteer to serve, attend meetings regularly and be willing to meet new people. Then you can begin to build your trusted resource network and soon you'll reap the benefit of being a part of the best business-building network in town. Studies* have shown that members of a chamber of commerce get instant credibility. These instant benefits include increased consumer awareness, favorability, reputation and likelihood of future patronage. Chamber membership translates in the consumer’s mind that your business is trustworthy, a neighborhood leader, and invested in the community. In addition to instant credibility, you have access to powerful resources and networking tools to take your business to the next level including opportunities to meet key elected officials, influence policy in our local community, free seminars to brainstorm with fellow entrepreneurs, demographic info, and consumer access for your business on the Chamber’s Website. And, chamber dues may even be tax-deductible. Consumers are 63% more likely to buy goods and services in the future from a company that they believe is a member of the local chamber. When consumers know that a business is a member of the local chamber they are 44% more likely to think favorably about it. Consumers who are told that a business is a chamber member are 51% more likely to be highly aware of it and 57% more likely to think positively of its reputation. What month, day, & year was your business established? Is your address the same as your company address?